Excellent vacation homes located on the water’s edge on beautiful Lake Hamilton. Come here to enjoy what Hot Springs has to offer from Garvan Woodland Gardens, Magic Springs/Crystal Falls, golfing, to the horsing and gaming at Oaklawn Park. This fantastic executive waterfront home is nestled in the beautiful and secluded Little Mazarn area on Lake Hamilton.Luxury surrounds you in the professionally decorated home that features a gourmet kitchen with all stainless steel appliances. Located on the water’s edge on beautiful Lake Hamilton, in a quiet area with easy access to all the attractions Hot Springs has to offer!Bring your boat or rent one for your stay, because this home has it’s own boat dock waiting for you to enjoy. With 4 Bedrooms/4 Full Baths and over 3000 square feet this home can easily accomadate a party ​ up to 10 guests. The homes are located on Chesapeake Cove just off Burchwood Bay Rd. in the same bay as Sams Pizza and only a short boat ride to many other restaurant’s on the lake. Four Bedroom/3 Bath home that features a main level gourmet kitchen with all stainless steel appliances, a downdraft cooktop and granite countertops. The main level also features the master bedroom and walk in closet. The master bath has a double granite vanity, walk in shower and a whirlpool tub. 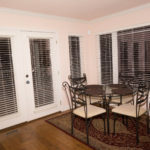 The living area opens to a covered balcony with a great view of the landscaped yard and boardwalk along the lakefront. Upstairs has a loft/sleeper sofa, bedroom and bath with a jetted tub. Downstairs features another kitchen, den, two bedrooms (1 bedroom with 1 queen & 1 bedroom with 2 queens) and a bath. The downstairs doors open to another covered patio and leads to the sidewalk to the water. By the water we have a tanning/fishing/area and a dock to tie up your boat. Luxury surrounds you in this Five Bedroom/3Bath home that features a main level gourmet kitchen with all stainless steel appliances, a downdraft cook-top and granite countertops. 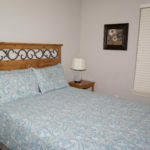 The main level features one bedroom with a walk-in closet and full bathroom. The living area opens to a covered deck with a great view of the landscaped yard and wood deck on the water’s edge along with a boatslip. 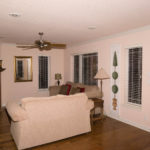 Upstairs has two bedrooms with a bathroom containing a whirlpool tub, walk-in shower and a double granite vanity. Downstairs features two bedrooms, bathroom, kitchen and den with doors opening to another covered deck with a walk to the lake. Four Bedroom/3 Bath home equipped with luxury features such as a gourmet kitchen with stainless steel appliances and a downdraft cooktop. 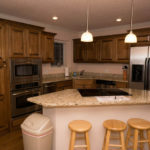 Granite counters are used throughout the home. The master bedroom and bath are on the main level and the master bath has a double granite vanity, a walk in shower and a whirlpool tub. The main level living area opens to a covered deck with great views of the lake and landscaped grounds. Upstairs has a loft/sleeper sofa, a bedroom with a king size bed and a bathroom with a whirlpool tub. The downstairs features another full kitchen, den, two bedrooms and a bath. One downstairs bedroom has 1 king bed and the other has 2 queen beds. The downstairs doors open to another covered deck and leads to the lake’s edge.